Wow! Excellent. Great read, I want to keep using words like that to describe this book, but that’s boring, so here’s some details. 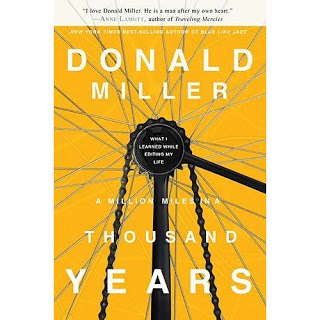 We have one life to live and Donald Miller does a superb job in “A Million Miles in a Thousand Years” helping the reader understand that life is boring and meaningless if we sit by and “watch the parade.” He reminds us – live your life, try new things and tackle difficult issues. He asks the readers to imagine how boring movies or books would be if the characters never tried new things or if they gave up when they faced obstacles. And I like, really like, the balance he provides by also writing about the fact that life won’t be perfect – there is no utopia. Yes, we need to be in the parade to enjoy life, but stop looking for perfection – enjoy and be involved in the life around you and you will find meaning in your story. I rarely want to reread a book – I’ve just finished this one and I want to reread it already! In “A Million Miles,” Donald Miller talks about taking the chances or making the changes in your life that you keep talking about, but don’t do anything about. Think about what you wish was happening in your life story that is not happening right now – is there anything you can do to make it happen? Probably not all at once, but one step at a time, can you make changes to your day that would make your life more meaningful? New feature starting tomorrow – WINNING WEDNESDAY! Will be happening every week. This week you have a chance to win a copy of “A Million Miles in a Thousand Years.” The publishing company, Thomas Nelson, sent two copies when I received my copy to review – one to read and one to share! I will randomly select a winner on Friday morning. Sure makes me want to read it and get out my "bucket list"….. I often read your reviews, though I'm not much of a "commenter" (is that a word??). . . anyway, when I read this one it talked about what's going on in my head right now! I'm in for the win! This book looks like a "must read" for me! I can never have too many books! From the description of this book I felt like it was speaking directly to me. Chance? I think not. Hoping to win a coy of this great book!! Thanks for joining me for my first book giveaway. I will contact and post the winner on Friday morning.